Fancy a day of cheese and cider pairing? Yorkshire artisan cheese makers, Shepherds Purse of Thirsk, has been selected by Yorkshire Food Finder to take part in one of its calendar of culinary trails across the region. The first guided gourmet tour company to provide access to the County's larder, Yorkshire Food Finder chose Shepherds Purse for its Cheese and Cider pairing trail on Wed 15 May. Foodies will enjoy a unique behind the scenes tour of the Shepherds Purse dairy, learning first-hand how the award winning cheeses are traditionally made. The company has been handcrafting its premium cheeses since the 1980s when founder Judy Bell realised that many people had a dairy intolerance and discovered that sheep's milk was a delicious alternative. Now the creamery turns out a wide range of cheese using milk from cows, sheep and water buffalo. Visitors will have a chance to sample the cheeses during the tour. From the dairy, culinary trailblazers will be taken to Ampleforth Abbey in the rolling Howardian Hills for a blossom-time tour of the orchards. Here, there are some 2,000 trees and more than 40 varieties of apples. Some of these apples are used to make juice and the increasingly popular monastic produce, including Ampleforth Abbey cider. From Ampleforth visitors will be taken to The Star Inn at Harome for a three-course gourmet dinner specially created by chef Andrew Pern, including elements featuring Shepherds Purses cheese and Ampleforth Abbey cider. There will also be a pre-dinner tutoring in cheese and cider pairing led by Shepherds Purse Chairman, Judy Bell. From its small cottage industry beginnings, Shepherds Purse has gone from strength to strength and is still a family run business, with Judy's daughters Katie and Caroline at the helm. The company has won dozens of awards over the years with their cheeses being taken on by specialist delis and major supermarket chains, as well as being a mainstay on many cheeseboards served up by top hotels, restaurants and pubs. Yorkshire Food Finder is all about celebrating the finest food and drink that England's largest county has to offer, in a series of food trails with unique behind-the-scenes access to producers at work and the chefs who turn their food into celebrated feasts. Each trail is 'hubbed' around a top restaurant and ends with a signature feast cooked by award winning chef-patrons. Find out more about this Yorkshire cheese and cider pairing here at Yorkshire Food Finder. 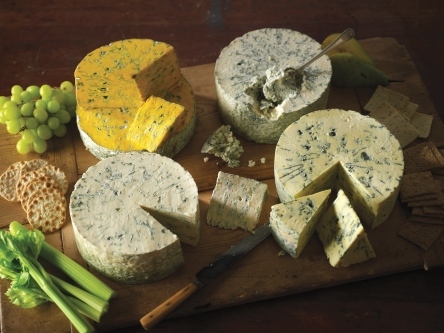 Read more about Shepherds Purse Cheeses here on their website.